The village of Nikia is situated above the volcano's caldera. The film director Eleni Alexandraki explains why Nisyros went from being a vacation destination, to a film set, to a part of her life. I first traveled to Nisyros in 1988 for a vacation. It was love at first sight. Straight away I felt the need to make films there. Ten years later I met my partner, Nikolas Kamariotis, who is from the island, further cementing my bonds with it. Wherever there are people, a place will change with the passage of time. 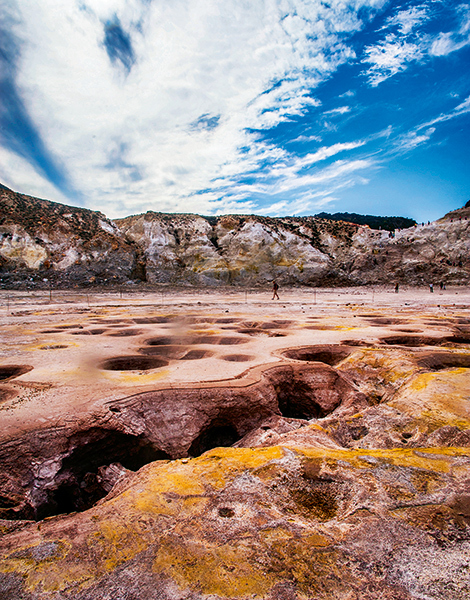 But the Nisyros volcano has been here for hundreds of millennia. No one can destroy the unique beauty of the lunar landscape of the crater that is in the heart of the island. When you are inside it, you can sense the power of the magma that is boiling underneath your feet, but without feeling threatened. In that moment it feels like you are walking on the moon. 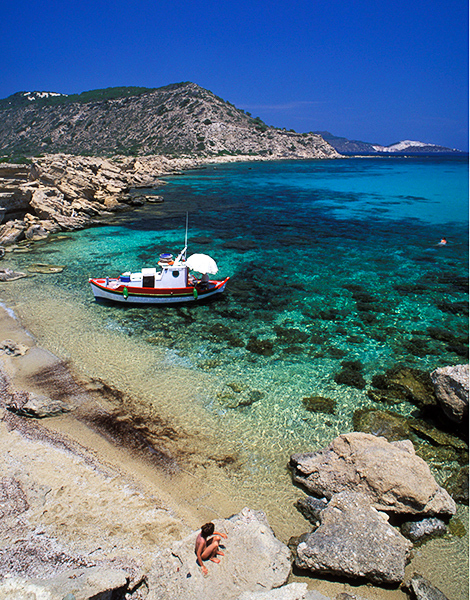 The beach of Aghios Antonios on the neighboring islet of Gyali, known for its pumice mines. I miss the island when I am away: the green fields in the winter; the carpets of daisies in the spring; the sea with its small, white-capped waves; the sweetness of the people and their sing-song accents. I miss the beauty of the beach of Hohlaki with its large round stones that create a music of their own as the waves wash against the shore; taking a boat ride to Giali, the “pumice island”, opposite from Nisyros and for a swim in Kaloutsi, with its enchanting, profoundly blue waters. I love Nisyros’ four villages: Mandraki and Pali are on the coast, while Emporeio and Nikia hang on the edge of the volcano’s crater. All have largely maintained their unique beauty, but each has its own character, traditional cafes and tavernas. Are you a gourmand and passing by Nisyros? You won’t know where to stop first. Certainly at Loli Kori, Panorama and Vegos. In the taverna Astradeni in Pali you will enjoy fresh fish, Balcony in Emporeio has wonderful meat, while Apiria and Aposperi are the places to go for meze. 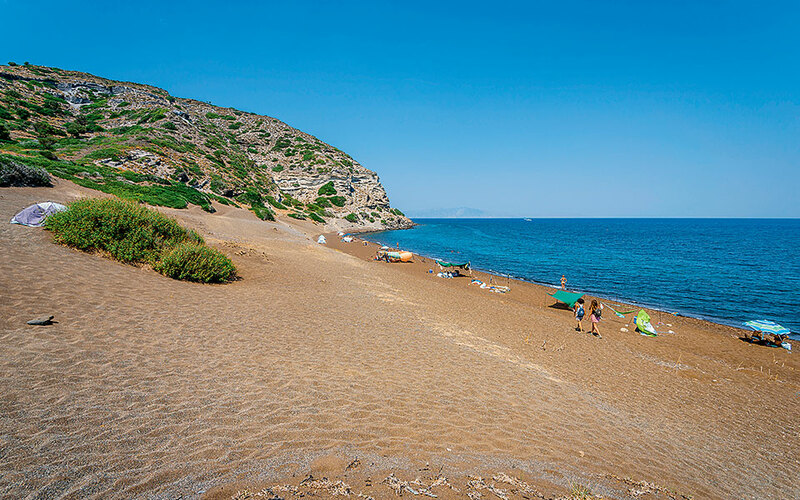 The beach of Pachia Ammos. At the cafe-bars Andrikos and at Enallax the merrymaking can last until morning. In Nikia you’ll find Nikolas’ cafe; in Pali, Falimento. If you’re looking for a place with a good view, climb to the island’s tallest peak where you’ll find the church Profitis Ilias, or head to the Windmill of Parthenis. Another enjoyable hike with great views is the small path that begins at the end of Liés Beach and takes you to the beach of Pachia Ammos. 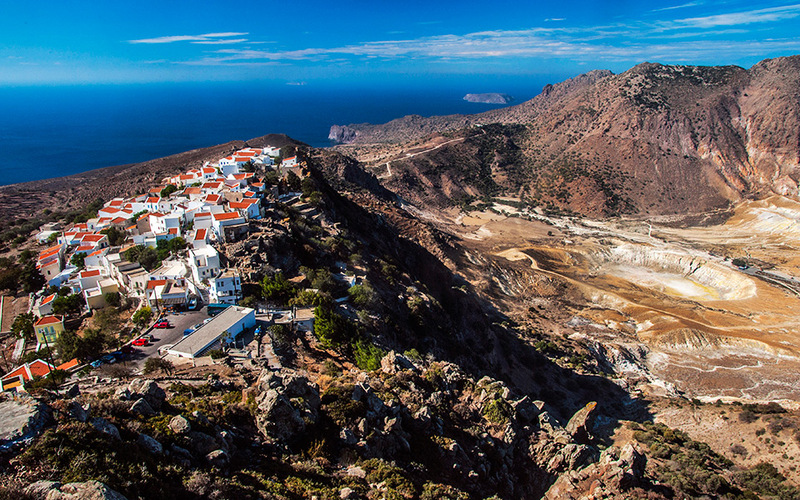 If you like hiking you will adore Nisyros. My favourite route begins in Nikia and ends at the volcano. Walking along an easy path, you can see the sea and crater from above as you pass through beautiful greenery. Nisyros has enchanted me and I have put down roots; I see it as my home. Here it is like I have rediscovered the warmth of my childhood. *Eleni Alexandraki is a director and organizes the film festival Ifestiada which is held every August on Nisyros.